Who knows what decisions were really made during that late-game rain delay? Who knows why the Chicago Cubs beat the Cleveland Indians 8-7 on Wednesday, winning their first World Series since 1908, the year Jack Johnson became the first black heavyweight champion. Some Cubs fans will tip their hats to the pluck and resilience of their young team, which had trailed in the series 3-1. Others will think the Cubs’ three-game series winning streak resulted from them rediscovering the form that saw them win more than 100 regular-season games. Still others will think that everything from their prayers to their routines and rituals helped lift the supposed curse from their team. But I like to imagine the World Series being decided by the sports gods during the 17-minute rain delay between the bottom of the ninth and the top of the 10th innings of the seventh and deciding game, the score tied 6-6. The way I imagine it, the sports gods convene in a three-dimensional roost that stands, like a home plate umpire, just behind the North Star. The roost is part ancient Roman senate, part English parliament and part black barbershop, all places known for their brilliant speeches and wise decisions. Mr. Solomon takes the floor. He looks like Frederick Douglass, the great American abolitionist, part man and part lion. Before becoming a sports god, Mr. Solomon was the head barber in a black barbershop. He chews Juicy Fruit gum but his breath smells of fried fish and hot sauce just the same. Before speaking, he smiles in the direction of the queen of the sports gods. Her mother named her Oya, but everybody calls her Miss Essie or Sister Storm. She’s in charge of weather, especially the weather during big-time outdoor sporting events. 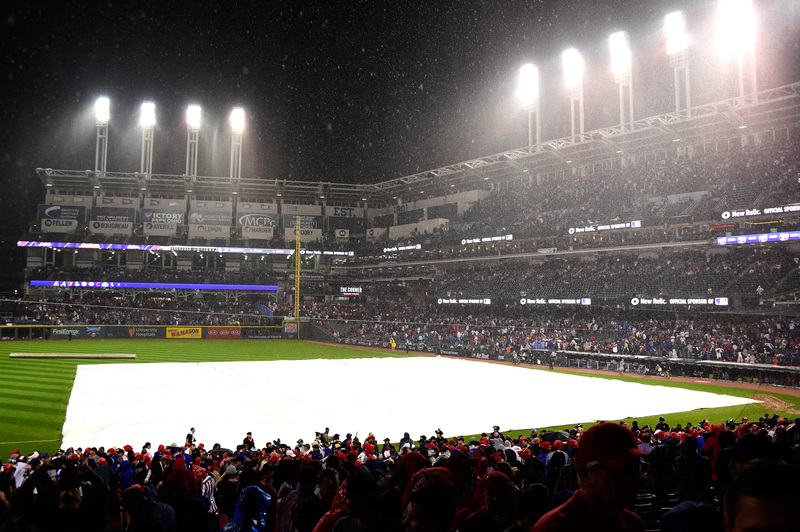 Grounds crew put a tarp on the field as the game is delayed due to rain before the start of the 10th inning between the Chicago Cubs and the Cleveland Indians in Game 7 of the 2016 World Series at Progressive Field on Nov. 2 in Cleveland. Mr. Solomon snapped his scissors in the air, just above the head of Mercury, a Roman sports god, who was in the chair. Mr. Solomon liked to cut hair when he dropped knowledge. At that, an approving rumble broke out among the seven sports gods, one for each continent. Their robes blow in a celestial breeze. They pass around the gourd filled with cherry Kool-Aid-flavored ambrosia. Each takes a big gulp, sealing their commonsense consensus. Mercury smiles and says that’s deep.